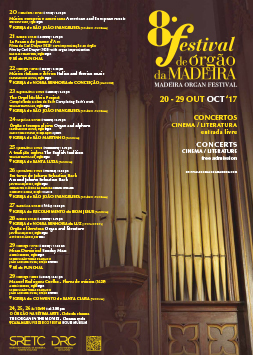 The eighth edition of the Madeira Organ Festival will take place from 20 to 29 October. This year there will be ten concerts and eight organists who will be performing music on the historic organs of the churches in Funchal, Ponta do Sol and Machico. The unique and inspiring atmosphere of the churches in Madeira, with their sacred ritual spaces, creates the ideal backdrop for the appreciation of these instruments, providing a true ocean of sonorities, resulting from the artistic ability of the organists and the diversity of the instruments which, thanks to their particular characteristics, allow for the performance of a vast and captivating repertoire. The Madeira Organ Festival provides an opportunity to hear some of the best organists of our time in varied programmes which highlight different facets of the instruments. Solo recitals, programmes of European and American music, Italian and Iberian music, organ and alpine horn, organ and literature are some of the themes which invite the listener to participate in a project of sharing, which has as its objective the provision of the widest possible reach, direct and wide-ranging, of the sounds and colours of our historic organs. Thus a cultural programme is constructed that is also known for its quality by the tourists who visit us, demonstrating the importance of events integrated within a cultural programme in places of national and public relevance, attesting to their relevance as strategic touristic and cultural resources. The cultural legacy is something that goes far beyond questions of identity and symbolism. And, in this context, the organs are unique indicators of a past that is still present, which generates knowledge and good practices, the re-founding of partnerships and shared projects, increase the number of those involved, public and private, in the appreciation of the cultural heritage and the creation of a diversified cultural event of the highest quality. The Madeira Organ Festival has been an excellent model of institutional cooperation. I warmly recognize the collaboration with the Diocese of Funchal and the outstanding enthusiasm shown by all the churches involved. Thanks to Master Organ Builder Dinarte Machado, the defender of the organs of Madeira, for his attentive and dedicated supervision. I also thank those who work for the Regional Cultural Office for their dedication and professionalism, and who for the second consecutive year, and in exemplary fashion, have taken care of the organization of this event put on exclusively with funds from the Region itself. To Professor João Vaz, Artistic Director of the Madeira Organ Festival, and largely responsible for the enthusiasm that I direct towards the knowledge and recognition of the historic organs of Madeira, my particular thanks for the effort he has put into this project. The Madeira Organ Festival began in 2010, as the consequence of a process of restoration and revitalization of the organs of Madeira, carried out from the end of the 1990s by the Regional Government of Madeira. During the course of its seven editions, the event has brought before audiences dozens of artists from Portugal and abroad, disseminating a vast repertoire, and presenting programmes adapted to the characteristics of the different instruments extant in the Region. 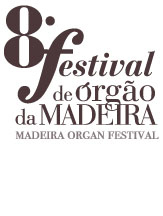 Apart from making known the richness of the organ repertoire and the heritage of the island, the Madeira Organ Festival seeks to exploit the different capacities of the organ, demonstrating not only its fact as a solo instrument, but also its potential as a member of very varied vocal and instrumental groups. Thus, in addition to recitals dedicated to central works of the history of organ music, programmes have been given using quite singular groups and repertoires. It is upon that singularity that the programming of the 8th Madeira Organ Festival concentrates. In the opening concert, Stephen Tharp brings music by American composers, whose works rarely appear in organ concert programmes in Europe. William Whitehead, as well as giving a recital dedicated to the English tradition, gives us a selection from the Orgelbüchlein Project (an initiative that brings Bach’s work together with music by contemporary composers). Also singular are the duo of alphorn and organ of Carlo Torlontano and Francesco di Lernia (the latter also performing a programme dedicated to Iberian and Italian music on the marvellous historic organ of Machico), the connection between organ and literature with Jan Willem Jansen and António Plácido, and the participation of Karol Mossakowski, who will improvise, on the new Dinarte Machado organ at the Cathedral of Funchal, the sound track for the film La Passion de Jeanne d’Arc by Carl Dreyer. As well as the above-mentioned thematic recitals, the essential presence of Johann Sebastian Bach will be ensured by Jan Willem Jansen in a concert with the Madeira Classical Orchestra, directed by Norberto Gomes, and the Portuguese composer Manuel Rodrigues Coelho will be the focus of the closing concert with the young organist André Ferreira and the St Thomas Aquinas Ensemble. A varied programme that will give the audience of the Madeira Organ Festival an ever-new perspective on music for organ and on the organ heritage of the Autonomous Region of Madeira.